The Ian G. Barbour Chair in Theology and Science is the cornerstone of the CTNS program at the GTU. 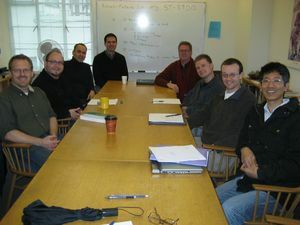 In an age when science is often seen to conflict with religion or in which they seem irrelevant to each other, the Chair brings the natural sciences into the classrooms of GTU doctoral and seminary students, invites UC Berkeley scientists to participate in GTU doctoral committees, and convenes Public Forums on faith and science issues throughout the academic year. In these and many other ways the Barbour Chair, now as a permanent program of the GTU, ensures that future generations of faculty and students may enter into the constructive dialogue between faith and science and be empowered for research, teaching and ministry. Both a physicist and a theologian, Dr. Ian G. Barbour was an unparalleled pioneer in science and religion. His 1966 classic, Issues in Science and Religion, launched the recent era of scholarly study in this interdisciplinary field. 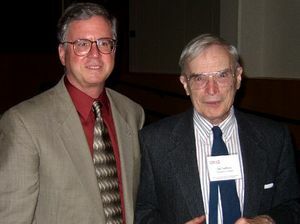 His prolific writings over many decades, including the two volume Gifford Lectures which dealt with ethics and technology as well as science and religion, have contributed enormously to the growing international, intercultural, and interreligious dialogue, and they continue to inspire both new and seasoned scholars. Dr. Barbour was a founding member of the CTNS Board of Directors and a pivotal financial supporter of the Center. When honored by the 1999 Templeton Prize for Progress in Religion, he donated the bulk of his award to CTNS, rekindling CTNS’s vision to endow a permanent Chair in Theology and Science at the GTU. The Chair Fund has grown with the support of many generous donors, and CTNS is currently looking to increase the endowment so that it can support operating costs and staff costs as well. We offer special thanks to Dr. Ian G. Barbour, Drs. John M. and Josephine Templeton, Dr. Francisco J. Ayala and Dr. Charles H. Townes for their gifts of $100,000 and above. Robert John Russell is the current Ian G. Barbour Professor of Theology and Science. This course is co-taught by Ted Peters and Robert Russell. This course will focus on the implications of cosmology, evolutionary biology and astrobiology/extraterrestrial intelligent life for Christian theology and ethics. Scientific topics include Big Bang cosmology, the discovery of habitable exoplanets, evolutionary biology, human origins, astrobiology and the search for extraterrestrial life. Theological and ethical topics include God, creation, Christology, eschatology and astroethics. The course counts in the Theology and Science concentration within the GTU Department of Theology and Ethics. Advanced M.Div. and other masters' level students are invited, especially with background in the basics of theology. A science background is not required. Doctoral students may upgrade from 4000 to 5000 level and write in their field of focus.